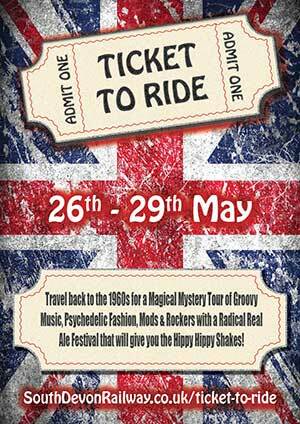 Get your ticket and take a ride back to the 1960s; a Magical Mystery Tour of groovy music, psychedelic fashion, mods & rockers and a radical real ale festival that will give you the Hippy Hippy Shakes! The 1960s brought us the greatest changes in music, fashion and society we had seen for decades. On the railways, Dr Beeching was closing thousands of miles of lines and thousands of stations and steam locomotives were being scrapped in their hundreds to be replaced by diesel traction. Ticket to ride transports you back to the nostalgic days when the Beatles, the Dave Clark Five and the Swingin’ Blue Jeans filled the airwaves of ‘wonderful Radio London’ and ‘Radio Caroline on 199, your all day music station’ Carnaby Street was the centre of the fashion world and Sir Alec Issigonis’ iconic Morris Mini Minor and Austin Seven first rolled off the production lines. Come and hark back to the days of Twiggy – and there’s a special welcome for anyone who comes along in 1960s clothing. Keep checking this page for the latest news ... more information coming soon! Normal Omnibus Public Timetable for 2017. (The South Devon Railway is not responsible for any damage that may occur by downloading or using third party software). The South Devon Railway reserves the right to change train services without notice.